Somewhere in my house are my third- and fourth-grade report cards. They are the only written records of my elementary school years, and I must assume that my mother saved those and no others because they were the zenith of my career. As I recall (still looking for them), the grades were good. But no matter how many As and Bs I earned, what drew my mother’s wrath were the perpetual Cs in handwriting. Yes, they used to grade students in handwriting, back when we had to swing from vine to vine to get to school each morning. Now, Pitt County schools are among some across the country that have dumped teaching cursive. Students will be taught to print until third grade, then they’ll learn typing. The argument is that teachers don’t have enough time to work it into the curriculum with all the other subjects they must cover, and that everyone types, anyway. She came from a time when a woman’s penmanship presented an important face to the world. Hers had the perfect smooth loops and lines of an engraved wedding invitation and hardly wavered as she aged. Mine had, and still has, the look of a rain-smeared “Lost Dog” poster on a telephone pole. On the other hand, my friends tell me that my texts aren’t any easier to comprehend. Well, it appears that some people are all in a swivet about the menu for today’s Presidential Inauguration Luncheon. Apparently a diet group analyzed the menu and said it contains 3,000 calories. Well, what do you expect them to serve at a luncheon for the inauguration of our 44th president – fat-free yogurt and granola bars? 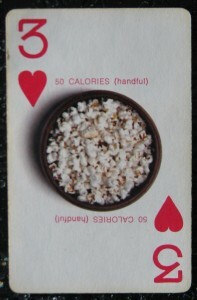 I believe many of those calories were pre-shivered off during the long wait outside. And the Obamas will be walking later, so they’ll get in some exercise. No to mention poor, old Beyonce, who’s probably still burning calories breastfeeding. And, hey, if you only eat like this every four years, you’re doing pretty good in the diet department. The menu pretty darn good to me, especially since I had chicken and rice soup with a pastrami sandwich and a clementine while I was watching the inauguration. I am fond of novels that I can crawl into and arrive in another land. Rarely can I achieve the same teleportation experience by watching a movie, and it has never happened in a restaurant. I’ve had many great meals in wonderful environments. But I’ve never, in a restaurant, had that same experience of visiting another world, until now. dish, a sashimi course, a fried dish and a grilled dish, among others. Not only did the chef create the gentle procession of eight dishes to our table, but they were served in and on pottery he made himself, so I felt we were completely in a world the chef created. The website advises emailing for reservations (essential) and someone will call to confirm. When she did, I was able to make some requests: no dairy or pork, per The Hub (vegan and vegetarian meals are possible). 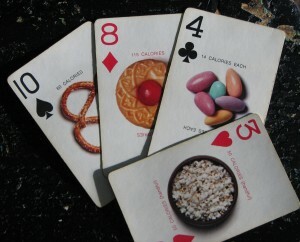 But, besides that, we had no idea what we’d find on our plates. scallops bathed in white miso. 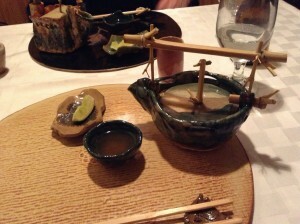 A dashi-based soup in a bamboo-handled teapot. My first taste of sea urchin, on the sashimi plate, which I ate without fear; the land I was in did not harbor fear. Crispy fried soft-shell crab with green tea salt. 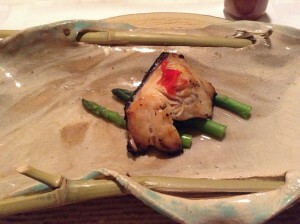 Black cod marinated for 48 hours in sake and miso, then grilled and perched on bright green asparagus. 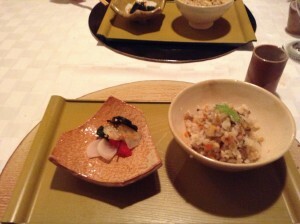 A bowl of rice with chestnuts, the nutty sweetness balanced by a plate of tart-salty Japanese pickles. The Hub and I spent three hours in this lovely land, sipping sake between courses in ceramic cups we selected from among the chef’s handiwork. We had only to focus on each other, the food, and the gentle, pleasant passage of time.